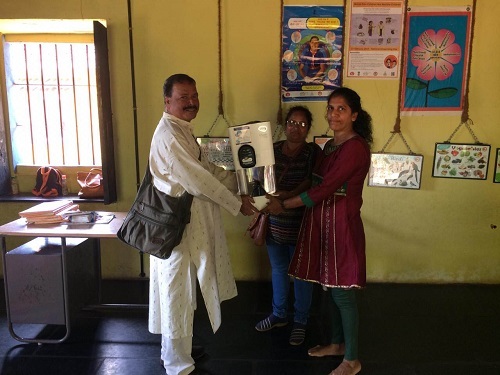 Ganv Bhavancho Ekvott keeping with its motto of making life easier for the people gave five convex mirrors to the Chandor Cavorim Village Panchayat and a water filter to the Andanwadi for use of the tiny tots visiting it. 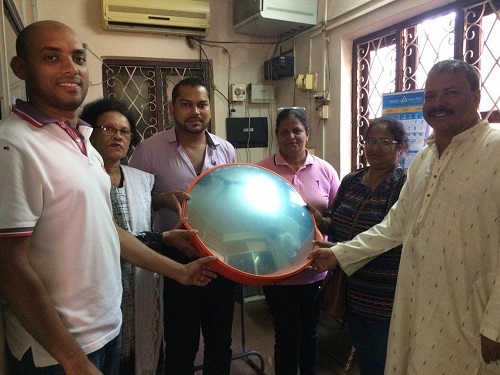 The convex mirrors will be installed at places where there are sharp turns so that oncoming traffic can be viewed to avoid accidents and Chandor Cavorim Sarpanch Edward D’Silva thanked GBE for donating the mirrors. GBE also donated a water filter to the anganwadi where around 20 tiny tots come every day so that they can now drink good quality water instead of relying on the PWD supplied water only. Significantly, the need for water filter was enunciated in the Gram Panchayat Development Plan prepared by the Village Development Committee as the need was felt when they visited the anganwadi. GBE thanked John Douglas Coutinho who sponsored the five mirrors as well as the water filter.